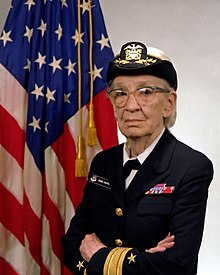 Grace Murray Hopper (December 9, 1906 – Januar 1, 1992) wis an American computer scientist an Unitit States Navy Rear Admiral. A pioneer in the field, she wis ane o the first programmers o the Harvard Mark I computer, an developed the first compiler for a computer programmin leid. She conceptualized the idea o machine-independent programmin leids, which led tae the development o COBOL, ane o the first modren programmin leids. She is credited wi popularizing the term "debuggin" for fixin computer glitches (inspired bi an actual moch removed frae the computer). Owin tae the breadth o her accomplishments an her naval rank, she is whiles referred tae as "Amazing Grace". The U.S. Navy destroyer USS Hopper (DDG-70) is named for her, as wis the Cray XE6 "Hopper" supercomputer at NERSC. ↑ "Cyber Heroes of the past: "Amazing Grace" Hopper". Retrieved December 12, 2012. ↑ "Grace Murray Hopper". Retrieved December 12, 2012. This page wis last eeditit on 2 Mairch 2019, at 17:18.